Each year as part of the Minor League Baseball Umpire Development program, MiLBUD (formerly PBUC) supports certain umpires to develop and officiate in off-season professional leagues. 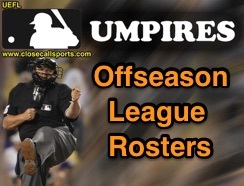 In October, Minor League Baseball assigned 12 umpires (nine PCL, three IL) to the 2016 Arizona Fall League (roster available via this link). AFL assignments have recently featured mid-to-high level Triple-A umpires on track for work at the Major League level (e.g., four 2016 AFL umpires also officiated MLB games in 2016).